Survival …. Survival for what. Now Jewish institutions trumpets its mission. Continuity. Continuity which will be assured if only we send our children to Jewish schools and camps and send them to Israel. Simply learn the customs and rituals and what is happening in Israel and our children will remain Jewish. The issue is not simply continuity. Yes our young people may be intermarrying at a rapid rate but intermarriage is not the problem. It is a symptom of the same issue "Why Be Jewish"
"How can we ensure the continuity of the Jewish people if our own grandchildren are being raised by non-Jews? ...It's not a crisis of intermarriage, it's a crisis of meaning. The population survey showed that only about half of Jews felt that being Jewish was very important in their lives" says Schrage. "Rescuing Jews became the be-all and end-all of Jewish identity for a vast majority of the Jewish world," says Schrage. When children asked "Why be Jewish" the answer was circular, if not xenophobic: "To rescue Jews and fight anti-Semitism." But that answer no longer satisfies, nor should it, says Shrage - not with a 3500 year old tradition from which to draw meaning and purpose. Learning and performing rituals and customs is a hollow action. The rituals and customs are only relevant if they symbolize all that is meaningful about Judaism. Eating gefilte fish is not enough if we don’t know that Judaism will always fight oppression and discrimination. Spending eight hours in temple on Yom Kippur is meaningless if we don’t recognize the lessons that Judaism teaches us about the treatment of the poor, the sick and the homeless. Having our children spend time in Israel may not help them learn the values of Judaism. In my opinion, the strength and teachings of Judaism about social justice would best be taught if we bring young Israelis here to visit the Jewish communities in this country. Why isn’t Judaism important to Jews? 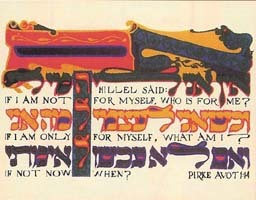 Because many don’t know what it means to be and “do” Jewish. While many parents taught their children how to live based on Jewish teachings and ethics, the Jewish community as an entity did not take actions which clearly evinced a Judaism that guided individuals on how to live, that answered real life issues and conflicts and that gave tools to provide moral directions. Judaism is worth continuing but it is in danger of disappearing if we continue to pursue the approach of many Jewish institutions.